5 Online GIF Makers to Create Animated Images - 5FOUND ! GIF is short for Graphics Interchange Format, which is a kind of bitmap images that supports animations. You may have seen many funny signature pictures on forums, Profiles, image boards in GIF format, actually you can make your own small animations and low-resolution film clips using these online GIF makers. Picasion allows you to create animated GIF images easily. You can use images from your local disk, or you can grab them on the Internet such as Flicker and Picasa Web. You can also use a photo taken with your webcam. You can upload up to 10 images. Images can be in JPG, GIF and PNG formats. One picture means one frame, so if you would like to make an animated image, at least using two images. After image uploading, you can specify and size of your GIF and the speed of the animation. 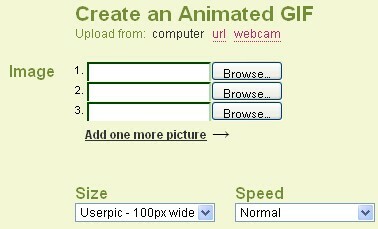 Gickr allows you to instantly create animated GIF online from your uploaded pictures, Flickr, Youtube or Picasa easily. It is very similar to Picasion, the maimum images you can upload is 10. 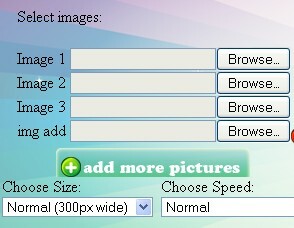 You can also customize the size of images and the speed of animations. Makeagif lets you make GIF animations by uploading your images from your computer. It is different from others in that it allows you to upload multiple images at one time by holding the “control” key down while clicking on the photos. You can then drag the images to order them the way you like. Then you will be asked how you would like to set your animation speed, resize your images etc. Createagif works similarly to other GIF makers. 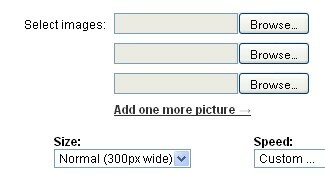 The differences are you can upload up to 20 images at most , and you can choose from four image sizes and animation speeds. While others will only allows you to upload at most 10 images but offer customized image size and animation speed. Gifninja allows you to create GIF images by selecting a movie file or multiple image files at one time. You can upload multiple images by holding down Ctrl when clicking on images. After uploading, you can adjust the animation speed using the sliders, then you can add a title and caption for the image. Another tool that Gifninja offers is the GIF spliter, which allows you to split a GIF image to single images.